I really like the blouse and how you styled it! Love the last photo! I love this casual look and the lace up blouse to is spot on trend! Loving anything laced up right now! Totally love how you mare it causal with sneakers.... Great look. Love the lace-up top! Super cool styled with the sneakers! Hope you have a great holiday weekend love! I love your lace up top! It looks great with the bag and shoes too! This outfit is so crisp! And I love the lace up blouse. What a neat detail! That lace up top is so pretty on you! I also love your Adidas!! 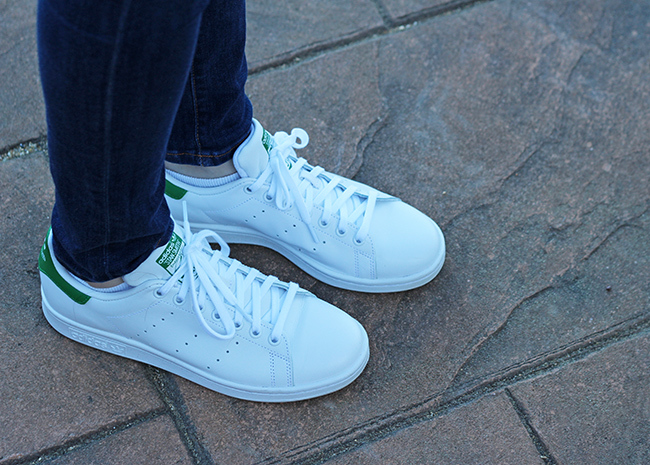 Loving the way you make it so effortless with the sneakers! Great update to the classic white blouse! that top is amazing!! and looks superrr comfortable! Love that blouse! It's hard to find a quality lace-up blouse. I've only seen the really flimsy peasant top styles. I'm totally digging the lace-up theme with the white kicks! Too cute, as you usually are, Rachael! I hope that you have a great Easter with the family! A very chic outfit and I think the lace up blouse is very elegant indeed. Great pairing here you look gorgeous! That lace up top is so pretty! Love how you styled it for a relaxed look! Thank you so much for the link up. I am so glad you liked the outfit. I love how you styled the lace up blouse with skinny jeans and sneakers. And I have the same bag and I love it. Have a wonderful weekend! I've had my eye on a lace up white blouse for a few months and haven't bought it yet but this post may have convinced me. I will hop right back to follow you. I like how you styled that gorgeous blouse in so effortlessly stylish look. I love the laid back vibe your shoes give this outfit! You have fabulous style!